-1 clove fresh garlic (grated). -peel and cut potatoes into small desired shapes. -cut beef meat into thin stripes and set aside. -in a medium sized pot add meat, seasoning,salt to taste and half diced onion, ginger, garlic add 150cl of water and bring to boil. 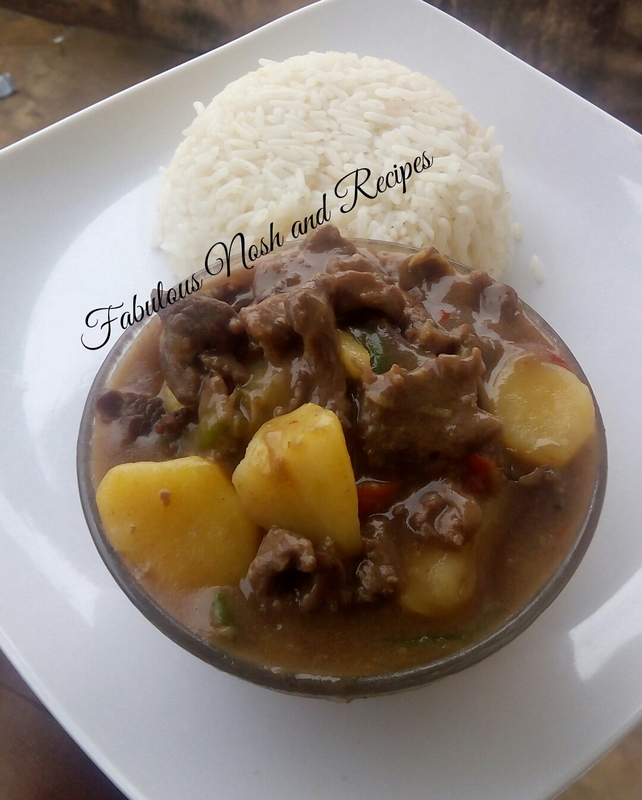 -when it starts boiling add curry powder and vegetable oil keep cooking untill the content of pot starts to dry up, now add potatoes and be sure the water content covers up the potatoes (if it doesn’t cover up add enough water to cover it up) and cook till half way done. -do not allow the water to dry up because the sauce is the most important part, it shouldn’t be too thick nor watery. -now add the green bell pepper, red bell pepper and onion stir and cook on low heat till done.